I was disappointed with my old sock club, so I decided to try something different. I joined Miss Babs tour. When the first kit came, I thought, ‘Pretty’. 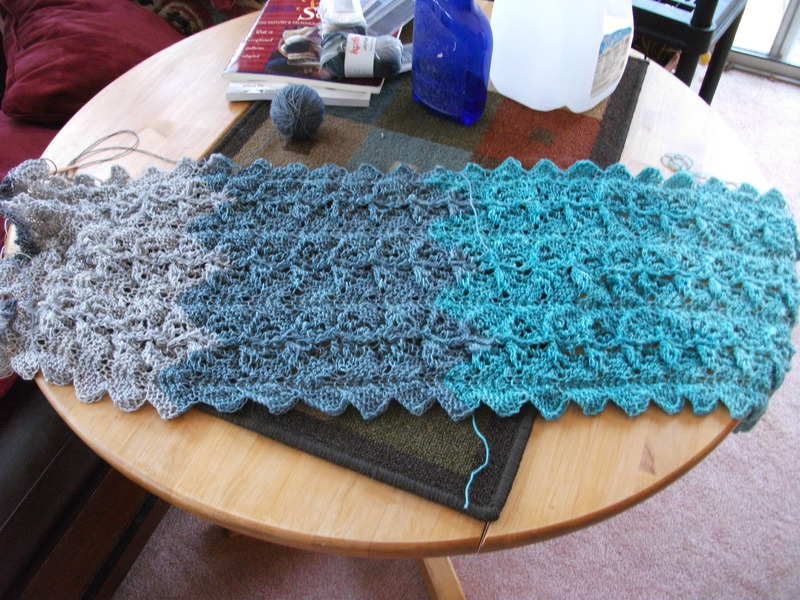 I started the scarf pattern that came with it and soon realized that it wasn’t for me. I tried two other patterns with like results. I finally settled on this one. It’s ‘Fleece’ from Knitty Winter 2011. This suits me. But see that light grey on the left. I can’t be certain if I like that color or not. I could leave it out and still have a good length. I think I’ll knit some socks pondering this predicament. This entry was posted on April 12, 2014 at 6:06 pm and is filed under Knitting. You can follow any responses to this entry through the RSS 2.0 feed. Both comments and pings are currently closed.